Hats off to Samsung once again. They definitely have another winner here and the other flagships of other brands will be eclipsed by the superlative S4. I don't really mind the plastic looks of it cos more often than not, I'd use some casing with it. After all, its what in the phone that really counts and amoled screens are just unbeatable. Can't wait for it to come out so that I can ditch my Xperia ZL for this monster of a phone ! Waiting for tegra4 powered smartphone. still looks like a plastic fisher price toy to me. powerful though...but still cheap...and ugly..plus what really kills it for me is that shinny plastic...why samsung why ???? Oh well..I'll get the One then..
which is better as per Synthetic benchmarks? Greate phone, I'll go get HTC One. Harry, 03 Apr 2013Am I the only person ever to think that the Galaxy S4 looks really pretty? Then again, I th... moreOfcourse you won't be the one but will be minority. 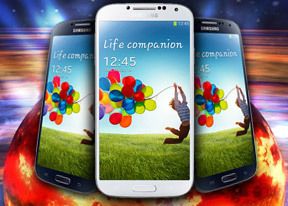 quad core for UK and Octo core for USA. Why? they are charging more £ for the UK than US version? Am I the only person ever to think that the Galaxy S4 looks really pretty? Then again, I thought that the One was ugly at first. And then it grew on me. AnonD-55345, 01 Apr 2013Samsung Galaxy s4 is definitely a deal breaker. Wondering if Samsung Galaxy S5 will have g... moreWe all love that.. but just not possible yet.most of more than 50m galaxy s brand users prefer swappable batteries. AnonD-120062, 31 Mar 2013HTC ONE a way better device at all! Samsung it's only crap gimmicks, nothing new like HTC ONE ... moreRead the review comparison between htc one & s4. Enough said. Anonymous, 02 Apr 2013Troll or not, I say the truth, android has icon tap tap like symbiam 20 years ago, come on guy... moreMy bro tested lumia 610 , just couldn't wait to get rid of it.